There is mounting evidence that Hillary Clinton supporters have been sabotaging the Bernie Sanders campaign, and the trail leads to the Democratic National Committee and a “national security” think tank made up of current and former Clinton supporters, staff, and contributors. In a March 30, 2016 videocast on YouTube (below), “Debbie the Sane Progressive” interviewed Stephen Coyne, a grassroots volunteer for Sanders, about state-level campaign directives that Coyne says sabotaged Sanders’ GOTV and canvassing efforts in Western Massachusetts. 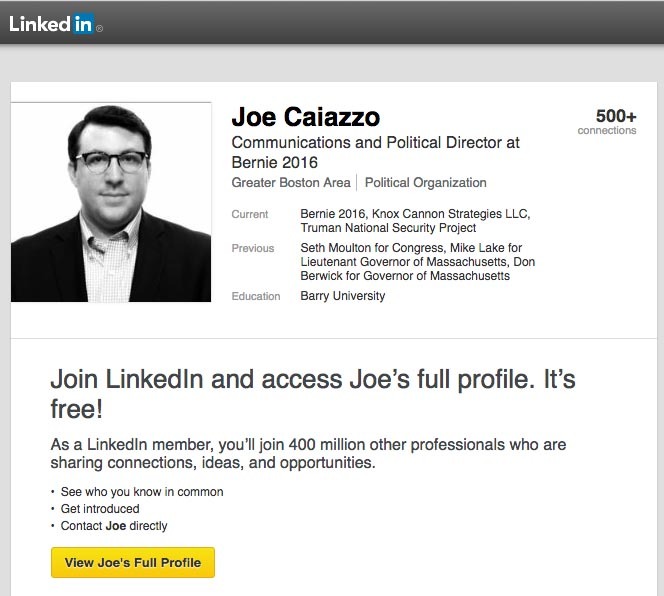 Joe Caiazzo, Bernie Sanders Communications Director, and employee of Clinton Foundation’s Truman National Security Foundation. In December 2015, the Massachusetts Sanders campaign hired Democratic strategist Joe Caiazzo as State Communications and Political Director. Coyne claims Caiazzo canceled their events, provided out-of-date voter roles, denied them canvassing material, and gave them orders to not open a campaign office. All of this worked against the best interests of the Sanders campaign, Coyne says, and demoralized volunteers, who subsequently quit. This is not the first allegation of Clinton supporters infiltrating and sabotaging the Sanders campaign. Niko House, president of North Carolina College Students for Bernie Sanders and Carolina Students for Bernie Sanders at University of North Carolina at Chapel Hill, posted several of his own videos testifying to similar experiences in North Carolina. House claims that Statewide Director Aisha Dew cancelled events and meetings, effectively got rid of key volunteer organizers, and refused several key endorsements. 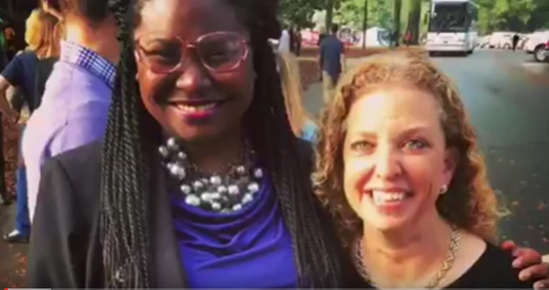 Dew has openly posted photos of herself on her social media with Clinton supporter and DNC chairwoman Debbie Wasserman Schulz, and at a Clinton captains organizing meeting. Dew and Schultz, November 2015, posted on Facebook six months after Dew was hired by the Sanders campaign. Also in question is NGP-VAN, the vendor that controls the DNC voter database. In December 2015, an alleged “bug” in new software allowed the campaigns to briefly see each other’s voter files. Josh Uretsky, Sanders’ national data director, copied Clinton voter data from the DNC’s voter database and was immediately fired. The DNC, however, cut Sanders access to the database. Joe Caiazzo lists the Truman National Security Project as an employer on his LinkedIn page. According to House, Aisha Dew is also listed as a “membership partner” on the Project’s website, although access to her page is password protected. The Truman National Security Project was founded by Rachel Kleinfeld, who served as CEO and President from its inception through 2013. Concurrently, she was personally appointed by Secretary of State Clinton in 2011 to the Foreign Affairs Policy Board, the advisory body to the U.S. Department of State, on which she served until 2014. Pierre Chao, Managing Partner, Renaissance Advisors, a lobbying firm that serves the aerospace, defense, space, intelligence and government services industries. John J. Kenkel, co-founder and managing partner, was also an analyst with The IBP Aerospace Group between 1998 and 2000, where he marketed defense and aerospace systems to former Soviet and Eastern European nations. Craig Hanson General Partner, Next World Capital, a venture capital firm investing in leading enterprise technology companies. Sally Painter, COO, BlueStar Strategies, which devises global government relations strategies for corporations and governments, and connects private sector services and products to governments. BlueStar CEO Karen Tramontano served as Bill Clinton’s deputy chief of staff and continues her work with the Clintons through the Global Fairness Initiative. John Freidenrich, co-founder and partner, Regis, a multi-billion dollar portfolio manager and investment adviser. Freidenrich is also on the board of directors of the Center for National Policy, whose former chair Leon Panetta, now CNP’s National Advisory Board Chair and former White House Chief of Staff, endorsed Clinton in January 2016. R. Hunter Biden Partner, Rosemont Seneca Partners, LLC, an investment firm founded in 2009 by the son of Vice President Joe Biden and Christopher Heinz, son of the late Sen. H. John Heinz III and stepson of Sen. John Kerry. The Heinz-Biden alliance unites both sides of the aisle, as Biden is a Democrat and Heinz a Republican. 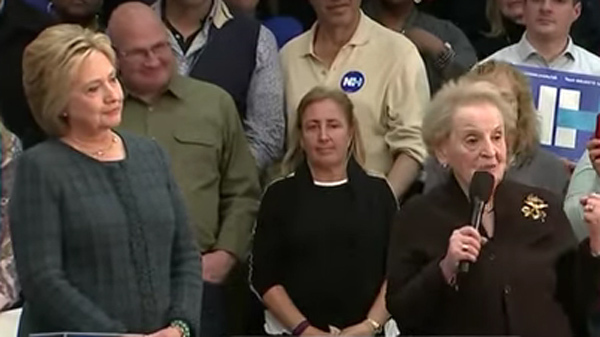 Albright campaigning for Hillary Clinton, February 2016. Whether or not the DNC and Clinton herself can be directly tied to sabotaging Sanders, Dew and Caiazzo do appear to be double agents. But because of the nature of her network, Clinton would not have had to have done any coordination. The capabilities of these think tanks, with access to private security firms, former intelligence agents, tech experts, and virtually unlimited capital would, for example, allow them to hack voter roles and remove Sanders’ supporters’ party designations in Maricopa County, Arizona. They certainly have the expertise, tools, motive and party loyalty to do it. But Sanders is not afraid of suing. He successfully sued the State of Ohio when Secretary of State Jon Husted decided that, despite Ohio election law, 17-year-olds who would be 18 in time for the November election could not vote in the primaries. On top of his suit against the DNC for limiting his access to the database, Sanders is also mulling over whether to sue over the results of Maricopa County election. He is waiting until April 4th, when the Arizona Secretary of State officially certifies the results. Meanwhile, Bill Clinton is being sued for election fraud by a group of Sanders supporters called MA Sanders Voters and Volunteers Disenfranchised by Bill Clinton. The group filed suit in Boston Federal District Court on March 30th and claims Clinton is guilty of openly campaigning at polling stations, among other illegal activities. After the latest “mistake” of leaving Sanders off the D.C. ballot because the D.C. Democratic Party forgot to send in his registration in time for the filing deadline, it is clear that someone inside the Democratic Party establishment does not want Sanders to win. With so much at stake for the billionaire class Sanders is running against, it’s easy to understand why Goldman Sachs CEO Lloyd Blankfein labeled this as a “dangerous moment” in American politics. Their gal Hillary is no match for the people-powered revolution Sanders has inspired, including record fundraising that will allow ample funds to move these lawsuits forward. NOTHING the Clintons do surprises me. I’d like to know where Anonymous is when you need them? This is exactly the sort of malfeasance by the “establishment” that they claim is their mission to take down and yet here we are gaining ever more insight into their past operations with no clear avenue towards thwarting them… Do we need to turn on the bat signal before someone will step in and put an end to the Clinton machine’s repressive tactics or simply sit here and let our rights be trod upon by them? I don’t know. I am trying to get people who are unaware of this insidious war machine that she represents to educate themselves. At some point, we simply have to tip, but I hope it’s before these corporate entities and billionaires begin to treat us like they have been treating the rest of the world. I’m with you. I’ve been pointing out to people for years that believing the corporations would never come home & treat us the way they treat people around the world was just wishful thinking. I wasn’t surprised when the corporate chickens came home to roost. Now we have poisoned water, contaminated soil, level 5 earthquakes in OK, etc. all for more profits. Even worse, if that’s possible, the TPP will give the corporations the right to sue anyone including our government for lost profits & damages if we try to stop them. They won’t even sue in our courts. There will be a group of corporate lawyers who determine how much profit they would have made, add damages, & then hand down their ruling which we will have no recourse to oppose. HiIIary supports the TPP when she’s not running for office, but as soon as she’s installed in the Oval Office she’ll go right back to working for the corporations & billionaires benefit. it is very difficult to get your average Democrat to look this deeply. That’s why I wrote this. Even I was shocked at the level of open corporate control is taking place in her “think tank.” The photo of the tank says it all. People need to reframe the conversation to talk not about Democratic vs Republican, but corporate vs people. For me, it doesn’t matter what party you belong to, if you march blindly while your party aligns itself to corporate interests, you support a system that is betraying democracy. Then it’s time for We the People to stand up and say enough is enough! I post everything I find all over the place in the hope someone will see it…. Facebook is aiding and abetting their unlawful behavior. Bernie’s database has obviously been hacked and is being used to disenfranchise his supporters. Doubters ask how a hacker would know who was going to vote for Bernie… well, now we know. Can’t thank you enough for your efforts. The link for Aisha Dew is password protected. But thanks anyway. I hope Bernie is aware of this since nobody seems to be able to get through to him about the moles in Bernie’s campaign headquarters. I suspect a plant who’s acting as a firewall blocking the news from getting to the people closest to him. This plant is probably one of the people high up the chain of command. This article’s referenced war machine think tank is so powerful and huge that it reminds me of Koch Brothers’ type of think tanks. And filing lawsuits with these people would probably take huge sums of money and years of litigation. This is a travesty that, in the worst way, can definitely continue to demolish a democracy which is already slipping through our collective fingers. Actually, I state in the article that her Truman project website is password protected. And I am aware that there are numerous complaints that Sanders campaign has not been responding to many attempts to get his attention. In trying to get to the bottom of all of it, coming to the Truman Project is truly stunning. Aisha Dew was hired in January of 2016, not before November 2015 when that picture was taken. That picture was taken at the South Carolina Candidates Forum which obviously had a lot of big name Democrats in attendance, Sanders supporters and Clinton supporters. Aisha Dew took a lot of pictures then of Sanders supporters, Clinton supporters, etc etc. Even though there definitely seemed to be some odd stuff in North Carolina I don’t think that picture really is evidence of anything. Also, you missed out on South Carolina. The Field Director for Sanders in South Carolina worked for Sanders from June 2015 through at least part of February 2016. The primary in South Carolina was on February 27th. He tweeted a picture of himself with Hillary Clinton on February 27th celebrating her win in South Carolina, thanking South Carolina and with the hashtag #ImWithHer. Seeing as how he worked for Sanders up through at least part of February that situation seems a bit odd. Last thing I’ll mention here… the DC incident. This was likely done by a lone oddball (seriously…he’s odd and craves attention) who was at one time the Democratic Committee Chair of Ward 5 in DC. His challenge was made on the 24th of March, was caught quickly and it will be resolved. It makes no sense for the Democratic Party to have been responsible for this. It wasn’t going to be something no one noticed and with his previous work as a leader for the Democratic Committee out there it makes them look bad. They are most likely not pleased with him for pulling this stunt. I’m not at all sure these shenanigans are a thing new. The history of our political systems is rife with nasty tales of shady deals and power plays. I think the explosion of information and exposure that we’ve experienced since Wellstone ran has a lot to do with it. At that point in time, there was no internet, with it’s masses of new info everyday. And tv news was limited to an hour a night. Now we’re overwhelmed in “facts,” everyone putting their own spin on them. It’s not easy making sense of it! Dan, if the questionable “facts” are contained in the Truman Project website then they are not my spin. I only am bringing them forward and connecting dots for people to make their own decisions. And I certainly have a right to mine perspective. The thing about it is the Dem party has their Wellstone and the vast majority are supporting the Boschwitz on steroids. So sad. I agree. Is someone looking into Ryan Hughes who allegedly took money from a Hillary Super PAC. Hughes heads the PA campaign for Sanders. No but thank you for posting. We need to organize all of this information in one place for … as someone else here said, we have to be the ones to move this forward. Thanks again! I don’t think that Bernie CAN be the one to do this. It may be best left to people like, if we could get them, Anonymous. Candidates talking about other candidates and sabotage (even if it bears out) gives an impression of whining and paranoia. It isn’t fair, but looking ironically to Hillary, remember how their claims of rightwing collusion,etc, served them. Probably need Bernie to concentrate on being Bernie, above the fray, since most of this is being done on a local level in state offices, and work to find evidence and once that is gotten, THEN we make sure the public can’t ignore it. Karen that is right. Good idea that leave Bernie to be above the fray and he has trained and inspired us to be the change. And yes the first step is to make it so the public cant ignore us! I Agree, Bernie job is to be Bernie and he is god at it.. and It is not a job any one else can do. Of course it’s not in the news ! MSM is shilling for Hillary, and is not going to cross her or the corporations that own the networks. Bernie is running against Hillary, the DNC, the MSM, and (now we learn) the Truman Project. Bernie is a gift to this nation. These people are stealing this election. And they are stealing our chance to receive Bernie’s gift – a gift this nation desperately needs. The Democratic Party has moved to the Right of where Reagan was in the 80’s, while the GOP has marched so far Right that they fell off the face of sanity. The Progressive Left are deprived of a voice in American politics by the party authorities pandering to a myth that America is a Center/Right nation. We only APPEAR Center/Right as we are in the main Center/Left to Left, and Center/Right is the closest we get to representation. If Americans are to be TRULY represented, we need to kick out BOTH parties, and start over. We need a party that represents TRUE Left Progressive ideals, and one that represents TRUE Right Conservative ideals. Both ideologies have their pluses and minuses, but if they are applied with a dedication to America, and a will to compromise, a workable solution can always be found. Working together, and compromise have been abandoned in a bid to pander to the Money Lenders, and that is the opposite of a Democratic Republic, as America was designed to be. Alsan, we are starting a new political party. It is called “United Progressive Party”. Come find us on Facebook.. always room around the fire! Why did the Sanders campaign hire these people without doing a background check on them? Very good question we all want to know. And that was the guy recommended by the DNC! Do we trust NGP VAN ? Regarding Aisha Dew. This article corroborates what Niko House is talking about. It makes her look either totally incompetent or like a Clinton mole. Sounds like the Sanders’ campaign needs to do a better job of vetting potential staffpeople! Wow thanks for posting! There is so much more than I could even cover in one article, I am grateful for others stepping forward and sharing this as well. So this is just another article that was just written. Nothing serious is coming out of this? No punishment? I read a comment that someone said, “this is only destroying or democracy and it’s slipping right through our collective fingers? Who is the right person to get this stuff too. Who can take action? Nicole, that is the great question, and of course it depends on what part of the information you are referring to. If you mean, those state directors, it apparently has been difficult to get past them, or to get Jeff Weaver’s attention. I think there are several reasons for that. My own opinion is that Bernie is trying to be strategic in his approach to the DNC. He has waited to take on the AZ problem, for example, until it is official certified. He might be holding off on criticizing or dealing with the state people because he does not want to appear to be a “trouble maker” for things that he can’t really nail down right now. but until we hear from him, I just don’t know what else to do but keep trying to get this information to him. As far as the other stuff, which I assume you weren’t referring to but will address anyway, it’s so important that people understand why we can’t support her. This seems extreme and yet, I only followed the dots and read the readily available information on her own think tanks on their own website. The summary picture of the tanks from one of the Board members page, speaks volumes to me, but Hillary supporters will think its some Republican attack, a stock photo. But I used it for a reason. I am working on finding out more about some of the other state directors we are suspicious of, and then presenting it to the campaign, in some way. Meanwhile, any ideas? If we can’t get to Bernie or anyone who can take action, anyone know how to contact Jane to help get Bernie’s attention? This is insane. I mean, hello ? They are stealing this election ! Exactly ! Nothing ever come of anything that is crooked in this election ! WHY NOT ? No one seems to know. Great idea! We could all tweet Jane! Thanks I think it helps for people who know what a “bug” might mean to explain why its not valid. Also, I heard an interview with the guy who copied the files. He was saying they knew there would be a trail and they wanted to leave one because the firewall was having trouble and they wanted everyone to know they were there. Did not make sense to me that he would just contact the database people and Bernie immediately before copying anything. Nothing about Hillary would surprise me. I agree that this think tank’s mission gives me the willies, but after watching the video interview, both you and they state that Joe’s association with it is right there in public view on his linked in page, so I fail to see any evil plot or sabotage happening. Ineptitude maybe. Lousy hiring practice, maybe. But lots of insinuation here without much back up. The intention of publishing the information about HRC and the DNC’s Mission with the Truman Project is, first, to educate the general public about the nature of their work. How many Clinton supporters know and understand what this think tank is and does, much less are even aware that it exists? Perhaps many more than I assume, because, silly me, I was not in any way aware that she had a cadre of defense contractors, hedge funders, multinational real estate investors, etc. working in this exact capacity. Perhaps you did. Many more than I did, but how many more don’t know? Second, if one is looking for capacity and motive behind what is happening to our elections right now, which is mostly being blamed on the Republicans, here it is. This article clearly shows she and the people at the DNC have a hugh investment in making sure she wins. You can draw your own conclusion. Because of the nature of this kind of election fraud, we will probably never know. But surely these are the kinds of things groups like this perpetrate when they do their “regime changes,” much like the one that took place in Honduras and resulted in the assassination of environmentalist Berta Caceres. As an environmentalist who believe that HRC is a threat to our national security with her support of fracking and international mining companies, I can now connect the dots to Berta death, and it is truly frightening. The public needs to understand exactly why HRC is not all who most of her loyal (and I believe well-meaning) supporters think she is and why she and Sanders are nothing alike. It is dangerous what she does, and the public needs to know. I don’t know if this is significant, but it just seemed really odd to me so I wanted to bring it up here. In one of the Bernie Sanders Facebook groups, someone mentioned that it was strange that right after she donated money to Bernie’s campaign, she started getting emails at that email address asking for Donations for Hillary Clinton. BUT… she said that she never gave that particular email address out to anyone else, so it seemed really strange to her that she would be getting requests for money to fund Hillary’s campaign. ???? Then, other people in the Facebook group started saying that the very same thing had happened to them… that they had donated to Bernie’s campaign and even though they didn’t give out their email addresses to anyone else– they also started getting emails requesting money to fund Hillary Clinton’s campaign. This happened around the same time that I first read online somewhere that Bernie’s camp had supposedly hacked into some computer program and had stolen a list of Hillary’s voters- and that it was supposedly a really big deal. That was also around the same time that Hillary’s supporters started making nasty comments on Facebook about Bernie– referring to him as, “Bernie Sanders and his cyber-thugs”. Anyway, my point is that it really stuck out to me as being really obvious that there must be a connection between the two. I had JUST encountered people saying that they were getting strange emails from Hillary (or at least, on her behalf) asking for money….. but yet BERNIE was the one who was being accused of doing something wrong. Hillary seems to always be deflecting things and blaming other people for what it is that SHE does wrong. I observe her do it all the time. In fact, I’m not even sure if SHE’S aware that she is projecting her own stuff onto others, but whenever I hear her blaming someone else for something now– warning bells go off in me that say, “Yep…there it is. She’s guilty.” There are so many examples of this- I really should start writing them down. lol! Sooo, I’m just wondering…. has anyone looked into her campaign possibly stealing Bernie’s supporter’s private/personal email addresses and then using them to solicit money?? I know you are aware of the many people who have had their voter status mysteriously changed in Arizona and elsewhere– that has resulted in voter suppression in record numbers, but is there maybe a direct link or connection between all of this that could be used to expose her (or those working on her behalf) of doing anything illegally? Also, I have heard that in certain states, Bernie supporters were intentionally being given the wrong information through emails regarding voting times and places– so they wouldn’t be able to vote. Isn’t blatant voter obstruction illegal?? Considering all of these different things, doesn’t it seem like it was actually Hillary Clinton who was the one who stole Bernie’s list of voters and then used his list in nefarious ways?? The more I think about it, the more it seems pretty obvious to me that this is what’s really going on. So, now the question is– what can we do about it?? It seems pretty obvious to me too. Certainly it has to seem just as obvious to the Bernie campaign ! What is being done ? Anything ? Nothing ? This is truly unbelievable. For now, please keep bringing these things to the comment section. I find it curious that others are coming forward with other scams like this one that involved the ability to hack. It is very possible that the data was stolen from Bernie while the guy who originally allegedly “stole” Hillary’s database could have just given her campaign his voter roll! No one would have had to hack anything. If it was the Clinton campaign who “discovered” the infraction, who knows what really took place? This behavior you describe is exactly what we deal with Tea Party Republican governor Scott Walker and his corporate fascists in WI. Projection. We used to say anything they ever accused us of doing was the very thing they were trying to hide. And yet, there they were doing it in front of all of us, as if they think we can’t see. Well its pretty clear the same this is being perpetrated in the Hillary camp. What do we do? I think we wait and see what happens. Nothing we can do but keep reporting it, getting it out into the network so people are aware, keep tweeting it to Bernie. One step at a time. Okay, I just checked when the breach happened, and found that it was in late Dec. I also just looked at my email account, because I wanted to check when I received the first email from HRC. The first I saved, was received on Dec 28, and I had not given my address to anyone. I thought that the address might have been shared from one of the orgs that I sign petitions at, but now thinking about it I realize that the petitions have my name, and the emails I get from HRC only say Friend. I started saving them after the first day or so, because I told myself I would donate to Bernie for each one I got from her. Anyway, after the 1st one I got one on each of the 29,30 introducing her and so forth ,and then on the31st I received five separate emails, asking me to donate $1. This made me angry, because right away I figured that she was trying to build up smaller donations to compete with the millions of small donations Bernie was getting. The thing is I did have a suspicion that she was the one who breached and took advantage of NGP-Van, but at that time, Bernie had mentioned that they thought they were breached in Oct. so I figured that since I didn’t get email until Dec. I must be wrong. If in reality Hillary or her team were the ones who actually caused and took advantage of the breach in Dec, it kind of fits, because she is so clever like a fox, and blaming him for what she did would be sly, indeed. She also asked for pledges to vote for her, and send me your birthday so I can send you a birthday card. To date I have saved 208 emails from HRC, Bill, Chelsea, or her team, all but a few asking for the one dollar dontation, and when she asked for money it was NEVER more that the $1.00. Lately she has been sending ones that ask you to sign a petition for something, for example, tell congress to vote on SCOTUS nomination. I figure, that she could use the info from petitioning to get name & address to use to fatten up donators, or even to get actual voter info to use. I don’t know but you know there is something fishy going on when a millionaire is asking you for a buck. Sorry for making this so long, I am one of those detail oriented people, and I have a really hard time separating out the “wheat from the chaff in both my thinking and writing. P.S. One of the things that made me angry about this whole deal, is that I had already been following Sen. Sanders because an article I read by him in his Bussfeed news, that really grabbed me in Sept of 2014, and I laughed at myself for signing on to the Newsletter of a Senator from Vermont; so I was pretty well on his side as soon as he announced, but I’m sure there were lots of people being fooled by HRC and her followers when they said he didn’t have a chance even though they liked him a lot better. While I agree with some of the comments in this article, a lot of it is taken out of context and overinflated. There are thousands of members of the Truman National Security Project of different political persuasions. I myself am a member (the same status as the people you cite in the article) and a Bernie supporter, as are many others. There is lively debate on our email listservs about what progressive values are, and most of us are certainly not neo-cons. It’s important to understand that the Truman Project was founded in an era when progressives kept losing on national security issues and constantly looked weak. John Kerry was a Vietnam vet, and he was “swiftboated.” Democrats need to have a strong national security policy, which to the Truman Project is inclusive of foreign aid, care for veterans, and independence from fossil fuels. The Truman Project has done great work on all of these issues, including work with state legislatures throughout the U.S. to pass alternative energy legislation and defending the foreign aid budget when it was on Congress’ chopping block. Rachel Kleinfeld was one of the founders of the organization, but it is an organization of people with many different viewpoints– it is not fair to say that it is neo-con. And, your analysis of the board members is a bit over the top. Look at the board members of any organization of this size– board members tend to be donors to the organization (yes, wealthy people) and otherwise important people (are we really attacking an organization for having Madeline Albright as a board member?). You can argue about whether or not this is a good thing, but the Truman Project certainly is not unique in this. I’m not saying that there hasn’t been ugliness between the campaigns, or that the Democratic party doesn’t have deep-seeded issues. But, a lot of your criticisms of the Truman Project are over-blown and off-base. Would you care to comment on just what you are doing in Mongolia with extractive industries before we publish a follow-up to our article highlighting your comments and focusing on mining over there? A link to this article appeared on the Jackpine Radicals site – jackpineradicals.org – a progressive site supporting Bernie. Check us out ! I am delighted to see questions being raised re/ voter suppression in multiple states, most notably in states with closed primaries. Closed primaries are most vulnerable since voters need to have indicated party preference ahead of time. So once the voter database is hacked, thousands of voters are screwed. Why are we not able to share our thoughts with SOMEONE IN CHARGE in Bernie’s campaign ? So frustrating ! It is painfully obvious that there is an organized effort to steal this election. Certainly Bernie’s “people” (if they are actually HIS people) realize this. Are they doing anything about it ? No one seems to know. Aa-aaargh ! It is a confounding situation. Bernie is a very very smart man. And very wise. He thinks like a visionary which means he does not just react, even to things like this. He watches, and waits, and probably talks to Jane, because she is so smart too. He has an inner circle I am sure he trusts, but has had to depend on the DNC for support because he had been an independent for so long. While I believe he probably understood the risks of running as a Dem, he might be confounded to find, like we are, the depths to which they might stoop. I think he is waiting, watching, and concentrating on what he needs to do to get to July and win the nomination. It’s all happening in real time, and he has so much on his plate. But yeah, he knows, and is thinking and planning. That’s my guess. Here’s a Reddit thread re/ same issues. It’s been locked, but there’s lots of good info. This is a stunner. I’m speechless… GREAT reporting, Barbara With! Thank you. Well written article – excellent research – thank you! As someone who knows Rachel Kleinfeld (and her family) I can see that she developed Samantha Power syndrome fairly early on, but she’s not sneaky or dishonest. Her life-long interest in human rights nowadays leans towards supporting the nasty American “bomb for human rights/feminism/Western values/democracy” mentality, but when the Truman Project started it was “we’ll lose elections until we bring back the Scoop Jackson crowd.” I agree the Truman Project is a natural fit for the Clintons, and obviously it’s going to seek to influence the Democratic primaries as much as possible – doing that is in its mission statement. I think this is a little sinister and sensationalistic, only because the world of advisers and organizers is surprisingly small. Dew should be evaluated on her merits or what look to be lack of same. I agree it would be prudent for the Sanders campaign to vet better, and I would definitely not want people associated with a pro-Clinton think tank. Where do you draw the line, though? Your choices can start narrowing rapidly. The whole system is pretty dodgy. I have not read through all the comments, only the article, but my question would be who was responsible for hiring Joe Caiazzo in Massachusetts, and Aisha Dew in North Carolina? It’s not enough to find out who these two are connected with; what about the judgement and connection of those who hired them. What is their responsibility here? Hi and good wishes to all. am aussie ninja blogger with many interests. the manipulation of elections by ELITE interested parties and lobbyists is a most under reported issue in many so called democracies. your posts provide a necessary counterbalance to the mainstream media controlled usually by ELITES also.